October 19, 2014 at 8 p.m.
An interview with the two thirtyish members of Duo Amal, concert pianists, artistic collaborators, close friends, one Israeli and one Palestinian. 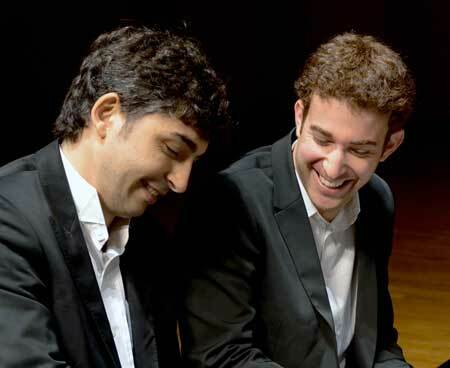 The pianists of Duo Amal, who will be playing at the Longy School of Music in Cambridge on October 19, have much in common. Yaron Kohlberg and Bishara Haroni are both young men in their early thirties. Each is an accomplished concert pianist in his own right, each started playing piano at age seven, and each studied with the same piano teacher. Yet, they also grew up in separate worlds, Kohlberg as an Israeli who grew up in Jerusalem, and Haroni, a Palestinian, originally from Nazareth, who moved to Jerusalem as a teen. When Kohlberg was invited to play at a peace conference in Oslo in 2011, he was inspired to contact Haroni and invited him to join in performing there as a duo. Though they did not really know one another at that time, they had known of one another over the years, and Kohlberg thought that inviting this “great Palestinian pianist” to play with him in Oslo made good sense. It was the beginning of a quite amazing relationship. From a musical and a humanistic perspective, the Oslo concert was a great success. When both pianists coincidentally moved to Berlin shortly afterward, even living for a time in the same apartment building, Duo Amal was born. The duo has toured widely, in Europe, East Asia, South America, Australia and the United States, and they begin a new month-long tour of United States, Japan and Mexico this fall. Their relationship was not easy at first, as both readily admit. Strong differences of opinion about Israel and Palestine created emotional challenges, but, as they continued to talk and to share their views, a sense of mutual understanding and compassion developed. As they both say, they talked about “everything” — intensely, continuously, and with gratifying results. Now, they consider each other close friends. Both say that their example of playing together has created an overwhelmingly positive response from audiences. However, misunderstandings sometimes also arise. Haroni said that his family and friends are extremely supportive, but that there are some Palestinians who feel that his working with an Israeli connotes an acceptance of the current situation, and that because they appear as two equal pianists onstage it suggests, in a misleading way, Palestinian and Israeli equality in the status quo, an interpretation of his partnership with Yaron to which he takes strong exception. Though they have not played widely in the Middle East, they are both open to it. Haroni has performed extensively in the West Bank but, as they both noted, there are a variety of reasons why it would be difficult for the two of them to perform together there and in some other countries in the Middle East. They are hopeful that at some point it may be possible. Musically, the two share a wide range of interests. Haroni’s favorite composer is Mozart, but he has, as well, a passion for classical Arabic Oriental music. Kohlberg likes rock in addition to his classical bent. For their performances as Duo Amal, the pair has commissioned compositions by an Israeli, Avner Dorman, and a Palestinian, Samir Odeh-Tamimi. Their concert at Longy will also feature works by Schubert, Prokofiev, Shostakovich and Rachmaninoff. The pair’s positive feelings about their own relationship have made them optimistic about the prospect of peace between Israelis and Palestinians. Both hope that their example of working together as artists, and talking through their differences to become close friends, can contribute in a small, but very real, way to that peace. Together these two young artists from two sides of a difficult divide give good reason to hope.